Water, the fountain of youth, the reason for our existence, this precious commodity is vital for life but have you ever wondered how much exactly does an individual require each day? This varies between many factors, where age and fitness play a crucial role. The body is almost 60 percent water, humorously; we are all just stressed cucumbers! According to the Mayo Clinic, the adequate intake for men is roughly 13 cups (3 liters) a day and 9 cups (2.2 liters) for women. Water is constantly lost from our bodies, through urine and sweat. It is also utilized by bodily functions such as a healthy metabolism and regeneration, so it is necessary that it is replenished. Water does not only improve mood and energy levels but enhances brain activity. There is also evidence to suggest that drinking more water can lead to weight loss by filling the stomach and curbing unnecessary hunger pangs. The benefits of water which include an increase in collagen and impart an inner glow to the skin have all been well documented. It also helps a great deal in improving eye health by reducing puffiness and dark circles under the eyes enabling you to feel and look less tired despite your hectic routines. 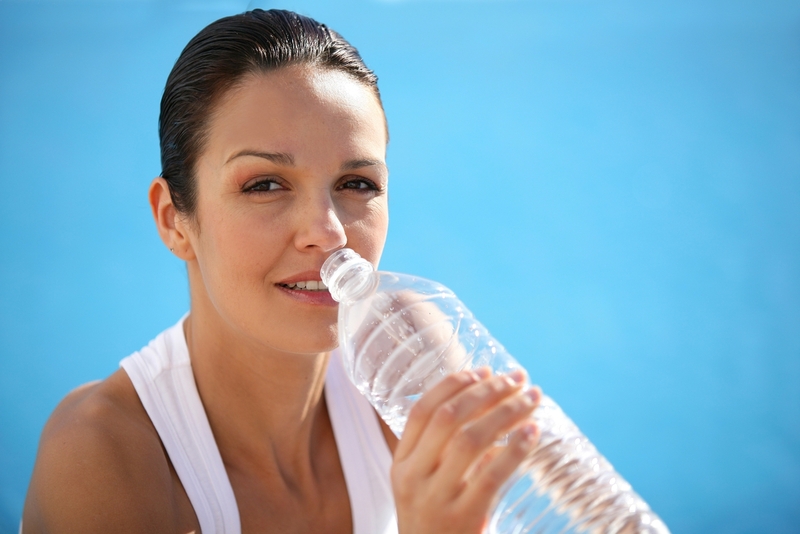 During strenuous activities the body requires extra amounts of fluids to replace what has been lost. While specific fluid recommendations aren’t possible due to individual variability, most athletes can use the following guidelines as a starting point, and modify their fluid needs accordingly. Contrary to popular belief, caffeinated drinks and beverages such as coffee and coke do not provide a good source for water intake. This might come as a shock to many people, but packaged fruit juices are not any different either! These beverages are laden with high amounts of sugar that is to be utilized or stored in the body. This requires an additional amount of bodily functions which utilize an excessive amount of water. Plump fruits and vegetables, especially green leafy vegetables are high in not just water but a myriad of helpful nutrients! So forget sugary treats and feast on nature’s goodies which are full of hydration that can make your body glow inside out.